Chester police explained in a Sunday statement that responding officers were dispatched on Saturday at roughly 5 p.m. local time to a residential area near Widener University on the 900 block of E. 15th St. "for what was described to them as a riot." It was later determined that the melee broke out after a number of individuals attempted to force their way into a St. Patrick's Day party to which they were not invited and proceeded to assault several of the guests. Police say when the intruders were turned away from the event, the assailants "kicked in the locked front door." "It was just very hectic," Zachary Whalen, a senior enrolled at Widener, told CBS Philly. "I would say probably 30, 40 people were just running around here, beating the crap out of each other." After responding officers managed to get a handle the situation, things took a turn when 20-year-old Dominique Difiore suddenly decided to take a swing at a unidentified police sergeant. Video footage of the encounter, which was initially shared on Snapchat with the caption "Widener police is wild," shows the officer immediately responding by smacking Difiore with the side of what's believed to be a stun gun. ​Difiore is later seen lying facedown on the ground, yelling out as an officer restrains her. 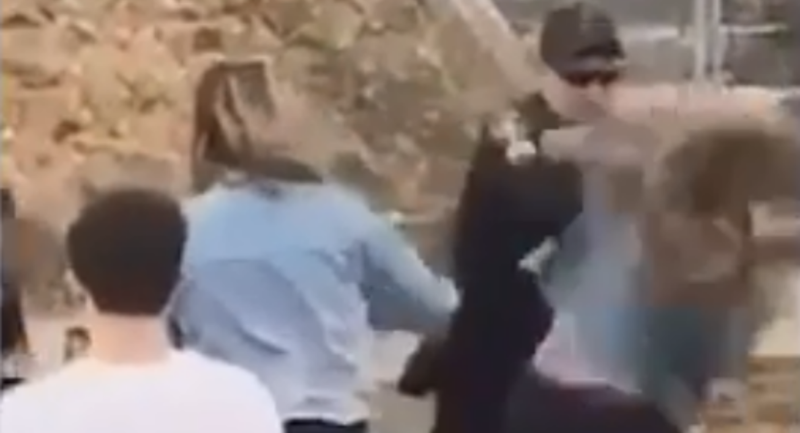 The brief video fades out as another officer is filmed shoving another woman onto the ground. Eyewitnesses have also indicated that after Difiore was struck by the officer, she was hit by the stun gun's prongs. "He dove to the ground, then tased her… that's what made it excessive," Cameron Thomas told CBS Philly. "A partial video of the event is circulating on various social media platforms. The incident, the video and level of force used in connection with the event are all currently under investigation," Chester Chief of Police James Nolan said in a statement. "There were numerous assaults and a college-age St. Patrick's celebration going on in the neighborhood at the time of this incident. Police are still conducting investigations to determine if other persons will be charged in relation to the events of the day." Arrested individuals presently include Difiore, Shawn Connelly, Tess Herman and Jaylene Westfall, who police say was one of the first intruders to assault one of the home's residents when turned away from the festivities. They were all hit with several violations, including aggravated assault and alcohol-related offenses. Widener University officials have indicated that none of the arrested persons are enrolled at the school. Additionally, they stated that the incident did not take place on campus and was not a university-sanctioned event.